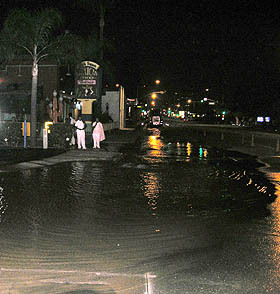 During construction along Main Street in the city of Orange, workers accidentally severed several underground fiber optic cables on the afternoon of 17 August 2006. This caused failure of most of the trunk lines for Childrens Hospital of Orange County (CHOC), a half-mile away. The break also affected external tie lines that connected the hospital to nearby units and clinics. April Moell was notified of the outage and the "internal disaster" that had been declared by CHOC's Director of Safety and Security. April dispatched eleven HDSCS members to the hospital to cover critical areas such as the Command Post, switchboard (PBX), Neonatal Intensive Care (NICU), Pediatric Intensive Care (PICU) and medical/surgical units. Early reports indicated that it would take the phone company about six hours to repair the fiber optics, but Murphy's Law was in effect. While working on the cables that evening, construction equipment broke into a water main, flooding the ditch and delaying fiber repairs for most of the night (photo at right). There were further delays when some telecom circuit cards failed during reinstallation the next morning. In rotating shifts of four to ten hours each, our HDSCS support continued. We used three Amateur Radio repeaters and two UHF simplex frequencies to handle logistics as well as internal and external medical communications. Examples included alerting San Bernardino County hospitals of the need to use Amateur Radio to contact CHOC for patient transfers, relaying the nurse's report on a patient being transferred, and contacting a physician for patient medication instructions. After 22-1/2 hours, all voice phones and most data/FAX lines had been restored and our operators were released.